On setting foot on the island I was immediately spellbound. There could be nowhere else on Earth quite like this. Such trees, plants, creatures and intriguing people you would never believe. This was a place I had to explore and record. 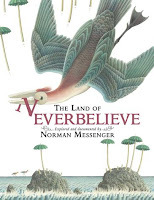 When Norman Messenger stumbled upon the Island of Neverbelieve, he couldn't quite believe his eyes: here was a world where chocolate grew on trees, mountains told stories, and fish flew in the sky at night. Here is your chance to explore the delights of the island from the Hamlet and the Flowering Meadow to the Magical Lake and the Spooky Dark Mountains. This is my favourite kind of book, the kind of book that doesn't really fit into any genre. It's not a picture book because it's not a story. It's set out like a non fiction title, a documented account of a particular island and the animals that can be found there, but it's not a non fiction title because the land of Neverbelieve doesn't actually exist. So while I love this book, my book selling side knows that it will be difficult to sell...not everyone can appreciate a book for being 'what it is', especially when 'what it is' doesn't 'fit' anywhere. 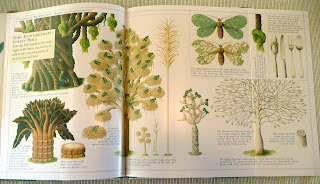 The book is a large size, and it's set out with drawings and labels and descriptions, like an old botany book. The premise of the book is that Norman Messenger discovered the island of Neverbelieve, and this book is his record of what he found there. 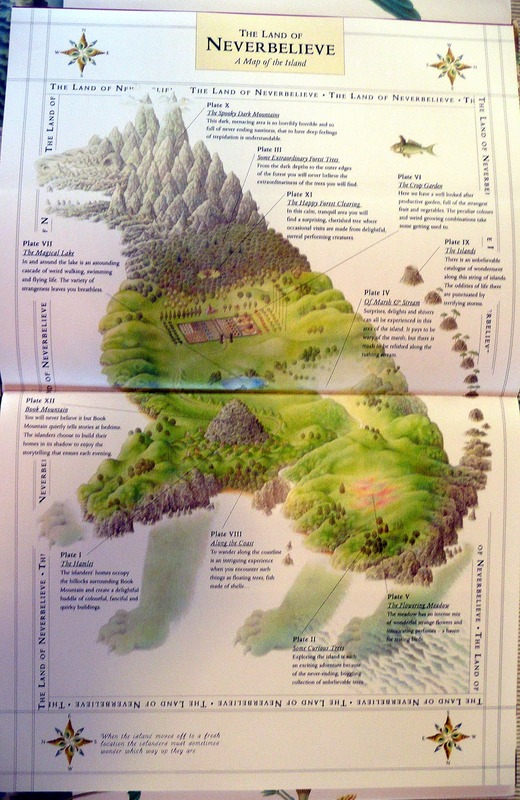 There are illustrations and descriptions of all the weird things on the island. The trees include the Tree of Horrible Hands, whose branches reach out and terrify passers by or the Pasta Tree which has clusters of pasta at the end of each bunch which van be cut off and cooked, they even have a herb attached which tastes just like basil! 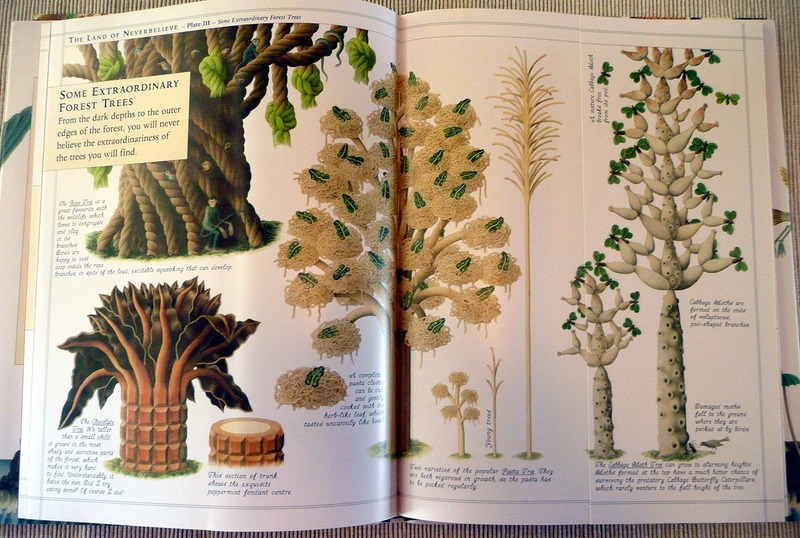 Each double page has a gate fold that opens, revealing even more amazing finds. the animals are just as curious as the plant life, there's the three headed Fork Head snake, the Double-Cream Cow which has two heads and two udders and a Secateur Crab that has secateurs for claws. Like I said, it's a book that doesn't easily fit into a particular genre, but it is a book that children will pour over.